(Nanowerk News) Ultrashort laser pulses in the femtosecond range have proven to be effective tools in driving photochemical reactions: under the influence of light, electrons change their energy quantum states, followed by the breaking of existing chemical bonds or the formation of new ones. As is now reported in Science (April 14th, 2006), a team of scientists from the Netherlands (FOM Institute for Atomic and Molecular Physics (AMOLF), Amsterdam) and Germany (Max-Planck-Institute of Quantum Optics (MPQ), Garching and the Universities of Bielefeld and Hamburg) has demonstrated that the detailed shape of the electric field inside a short light pulse can be used to control the motion of electrons involved in chemical bonding and to change the outcome of a simple chemical reaction. This result - obtained on the dissociation of D2 molecules - may open a new way of steering intra-molecular electron transfer processes like those in DNA base-pairs. Ultrashort laser pulses in the femtose Intense light pulses of the order of a few femtoseconds (1 femtosecond is one millionth-of-a-billionth of a second) are capable of exerting a force on electrons that is comparable in strength to the inner-atomic forces that hold electrons on their orbits around the nucleus. In order to exert these forces on electrons in a controlled way, pulses of laser light with a precisely reproducible waveform are needed. In 2002 Prof. Ferenc Krausz, director at the MPQ (at that time Professor at the Vienna University of Technology), succeeded in cooperation with Prof. Theodor Hänsch - using the Nobel price awarded frequency comb technique - in developing "phase-controlled" laser pulses: Here not only intensity and frequency but also the phase of the carrier-envelope is precisely defined and reproducible. Special about a laser pulse with reproducible phase is that minima and maxima of the electric field occur each time at the same position within the pulse. By varying the phase, the timing of minima and maxima can be varied with respect to the pulse peak, changing the form of the wave significantly, if the pulse comprises only few wave cycles. The team of Prof. Krausz and their collaborators has since demonstrated the utility of phase-controlled laser pulses to generate attosecond light pulses (1 attosecond is a billionth-of-a-billionth of a second) and to control the motion of electrons in and around atoms on an attosecond time scale. The question posed in the current work by the Dutch-German research team was if electrons that are involved in chemical bonding in a molecule can be steered by the electric field of phase-controlled laser pulses in a similar way, and - if yes - can this light-driven electronic motion affect reaction dynamics. 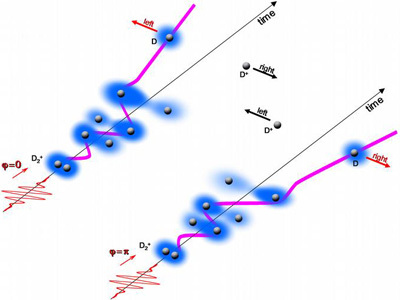 At MPQ, Dr. Matthias Kling (post doc in the group of Prof. Marc Vrakking) and his collaborators studied the influence of intense linearly-polarized laser pulses with duration of 5 femtoseconds on the motion of electrons in a chemical bond. In the experiments, positively-charged deuterium molecules (D2+), also known as heavy hydrogen, were used. These molecules are very simple: they consist of two positively charged ions (the D+ nuclei, each containing a proton and a neutron), and one electron that is left behind following ionization of neutral D2 with a laser pulse. With a special camera that was developed at AMOLF, the Dutch-German team of scientists measured the emission direction of deuterium ions (D+) and deuterium atoms (D) after dissociation of D2+ molecules with respect to the laser polarization axis. As long as the scientists used conventional laser pulses without phase control, equal numbers of deuterium ions (as well as atoms) were ejected in both directions along the laser polarization axis. Using phase-controlled pulses with a specific value of the phase (? = 0, see upper panel of the figure), deuterium ions and deuterium atoms were preferentially emitted to the right and left, respectively. A simple shift of the phase to ? = 180 degree, resulting in the same waveform with the oscillations flipped around the propagation axis (see upper panel of the figure), turns the outcome of this simple laser-induced reaction into the opposite: the D+ ions preferable fly to the left and the D atoms to the right. On the basis of quantum mechanical calculations the scientists can explain the observed phenomenon. Before exposure to the light wave, the electron is in its lowest-energy state. It is found predominantly between the two deuterium ions (see figure). The strong laser field, directed along the axis of the molecule, enforces the electron to get localized on the right or left side of the chemical bond in an oscillatory fashion. The timing of this electron "hopping" can be controlled with the phase of the laser wave. In quantum mechanical terms, this localization is possible because the laser excites the electron to a so-called coherent superposition state. This softens the bonding between the two positively-charged nuclei, which consequently start moving apart, with the electron hopping between them whilst the molecule disintegrates. When the molecule breaks up into two fragments the electron settles on one them (which remains neutral), while the other fragment is detected in the experiment as a positively charged ion. Since the dissociation of the molecule requires a characteristic time, the scientists can - by choosing the phase - selectively drive the electron to be on the desired ion at the time of fragmentation. Processes, in which electrons are transported, are extremely important in chemistry and biology. For example, electron transfer plays an important role in both damage and repair of DNA. The here described results of the Dutch-German research team on the dissociation of hydrogen molecules may provide a clue how to control the transfer of electrons in larger systems using the electric field of light. This work may also have an impact on the new field of molecular electronics, where the flow of electrons between molecules may be steered in a controlled way with laser pulses.